How to draw a water bottle cute and easy. 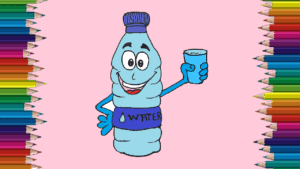 Water bottle cartoon drawing and coloring with this how-to video and step-by-step drawing instructions. How to draw cartoons for kids and everyone. Draw out the top of the bottle cap. Draw the rest of the bottle cap. Draw the middle part of the bottle cap. This is the way to have a detail. Draw the base of the bottle cap. This is the twist part out of the bottle. Finally, for the lid, draw the usual thin lines at the top of the lid. Now, we will switch to drawing bottles. Draw the upper half of the bottle where the lid and bottle meet. Draw the bottle body. They can have many different shapes but currently, you can use example images as your reference. Next draw an animated face for the water bottle, with big eyes and a smile. Add some details. Draw your bottle the way it will appear to see through. And that’s all! Color in your bottle with the means you choose.